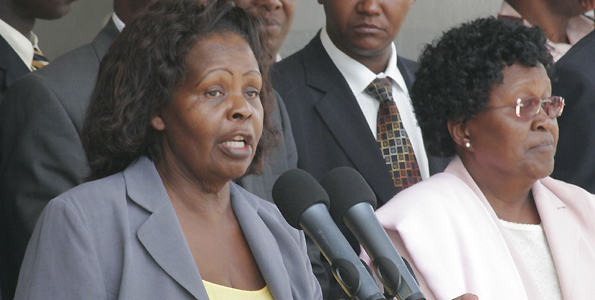 State House has moved to dispel fears over the whereabouts of First Lady Lucy Kibaki. In a statement, the Presidential Press Service said the First Lady is “fine” and exercising her duties. The statement was in response to a story carried by Taifa Leo, a sister publication airing readers’ concern over her long absence from the public. “We would like to assure readers of Taifa Leo that Mama Lucy Kibaki is fine and exercising her duties at State House, Nairobi where the offices of Organisation of African First Ladies against HIV/AIDS are,” the statement said. The First Lady is the chairperson of OAFLA Kenyan Chapter, and according to PPS, has been busy participating in activities to fight the disease, taking care of the infected and the orphans. “She has also been been helping other vulnerable children in society and empowering women and the girl child. “In her operations at OAFLA, now and then and when she deems it fit she has communicated to the media. An example is recently during the International Women’s Day last month when she urged Kenyan women to overcome unhelpful cultural barriers and the fear of loans so as to play their rightful role in national development,” the statement said. PPS noted that she has continued with activities that do not require involvement of the media such as fighting for the poor “silently”. State House said the organisation used the offices at NHIF building, Nairobi for two years. “After that, the offices of OAFLA have been at State House, Nairobi,” PPS said. The First Lady has demonstrated a liking for Kiswahili and Taifa Leo, the only Swahili newspaper in Kenya. Her statements are always issued with Swahili versions. The reaction was sent to the newspaper’s editors in Kiswahili. 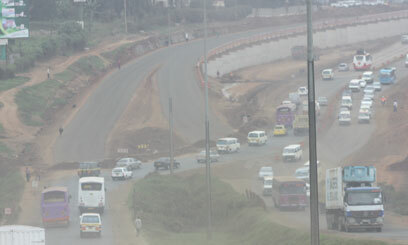 Nairobi — The completion of the Thika superhighway has been pushed to June. Several hitches have held back the project, missing both the December 2011 and March 2012 deadlines. Consulting Engineering firm APEC’s Managing Director Johnson Matu said besides land acquisition issues, heavy rains in the latter part of last year caused unexpected delays. “We are having an issue with the removal and relocation of service lines, water pipes, power and some have not be relocated, so the contractor was unable to complete the works,” he said. The relocation process and land acquisition has cost an estimated Sh5 billion, while supervision costs now stand at Sh1 billion. So far, total costs for road works on the superhighway have reached Sh27 billion with each of the three lots of the project over 90 percent completed. Spanning 42 kilometres (km) the Thika superhighway Project will have a 39km footpath and cyclists’ lane. Lot 1, which is being undertaken by Chinese contractor China Wu Yi Company Limited stretches from Uhuru Highway ending at Muthaiga roundabout. “The scope of that work includes improvement of Forest Road, Kariokor Road and Murang’a and the connection of the Globe flyover to Tom Mboya,” Matu explained. Lot 2, under the supervision of Synohydro, is between Muthaiga roundabout and Kenyatta University, about a 14 km distance that is 93 and 94 percent complete, needing basic road furniture, lighting and signage. Sheng Li engineering, the contractor overseeing completion of Lot 3 the last portion of the road to Thika, has already began construction of foot bridges. “The bridges at least in our lot will be in the range of Sh20 million each. We are constructing five and the first is almost complete,” Sheng Li Engineer Zeng Xlanmin explained. In all, there will be approximately 17 footbridges servicing pedestrians from Nairobi to Thika town. A toll station and weigh bridge are being constructed along the highway in Lot 3 (in Ruiru), which once complete will be operationalised by Parliament. Although fees are yet to be determined, traditional toll stations charge vehicles by type and in the case of heavy load trucks, the fee is determined by the number of axles, wheels and height of the truck. The eight-lane highway that has re-written Kenya’s highway rulebook is expected to accommodate 300,000 cars daily. Even though the temporary speed limit has been set between 30 and 50 kilometres as construction is on-going, Senior Superintendent of Police Leonard Katana said safety will be crucial when the speed limit is increased. “It’s a good road so let’s not change it into a killer road. Officers will monitor drivers. The speed limit will remain. However in future we will propose to be a bit higher, but we must drive safely,” he said. Furthermore, Information Permanent Secretary Bitange Ndemo stressed the need for motorist to respect the traffic laws. “I have driven on Thika road only to see matatus calling for passengers at the centre of the highway; that just means they actually don’t know what a highway is,” he said. Ndemo said the concept of a highway needs to be properly communicated to Kenyan motorists, requiring Ministry of Transport and relevant government agencies to formulate an aggressive education campaign. “The Ministry of Transport should announce that it has cancelled all drivers’ licenses until everyone goes for another test on how to use the highway. Otherwise Thika Road will not help,” he asserted. So far, two sections of the Sh2 million three-level Pangani interchange are operational, servicing Forest Road, Thika Road, Murang’a Road and Ring Road Ngara, as well as the recently opened Muthaiga underpass. NAIROBI, Kenya, Apr 10 – The completion of the Thika superhighway has been pushed to June. 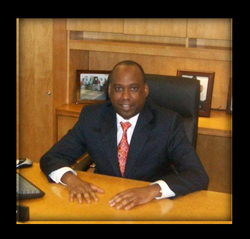 David Karangu was born at Grady Hospital in 1967, but grew up in Kenya. He later enrolled at Morgan State University in Baltimore, MD where he studied Marketing. In 1985, he won an internship by the General Motors Corporation, where he spent his summers working at Jerry’s Mazda. During this time, he developed a passion for the automobile industry. He worked in every department of the dealership and made up his mind that the automobile industry was going to be part of his future. Upon graduating in 1987, he went to work for the Ford Motor Company in Jacksonville, FL. At Ford he spent the next eight years rising through the ranks and honing his skills while working with Ford dealerships throughout the State of Florida. He left Ford in 1995 and attended the NADA Dealer Academy. While attending the academy, he worked as a Sales Manager at a Lincoln dealership in Melbourne, Florida. On July 1, 2005 he opened Mercedes Benz of Augusta. This was to be the crown jewel of the new empire. From the beginning, it was a success, setting new records for a Mercedes dealership and David being one of five African Americans in History to own one. April 2nd, 2007 was yet another milestone in his automotive career. He acquired a BMW dealership in Columbia, SC and renamed it BMW of Columbia. Along with it came other franchises – Ivory VW and Ivory Subaru. Black Enterprise Magazine has ranked the Ivory Auto Group as the 26th largest minority owned Dealership in the United States with Sales over $100 million Dollars annually. In December 2007, David sold the entire Ivory Group of dealerships to Group 1 Auto Group. He retired at the age of 40 to pursue his lifelong dream of travelling throughout the world, he also became a chef and a luxury homebuilder (www.sterlinghalltour.com). Only July 14, 2010, he purchased the former Steve Rayman Chevrolet South and renamed it Ivory Chevrolet. Then in April 2, 2012 he purchased Sutherlin Mazda. This is yet another new beginning as he rebuilds his auto empire. Throughout his journey, David has always believed in helping and motivating others. He has given motivational speeches to various groups throughout the US and to corporations in Kenya. He has donated funds in Kenya for HIV/Aids awareness, educational scholarships and orphanages. July 28, 2005 was declared “David Karangu Day” by the Mayor of Augusta. In 2007, the Mayor of Augusta gave David an Honorary Key to the City. The Governor of the State of Georgia appointed him to the board of the Medical College of Georgia – the second largest hospital in the State for a three year term.